Jesus hand picked a group of 12 men to follow him and be the closest people to him. But even Jesus had one of his closest people betray him and walk away. Judas was there with him through thick and thin, he saw all the miracles all the healings. He was in the thick of it then he chose to be disloyal and took the path of betrayal. I saw this video sometime ago from Pastor Ed Young talking about betrayal in Church life. Its aimed more at church leaders but important principles to here. By the way I am here at MKCC for the duration. Hope you are not disappointed. Years ago I made the mistake of walking away from the table because of pride. I will never make that mistake again. 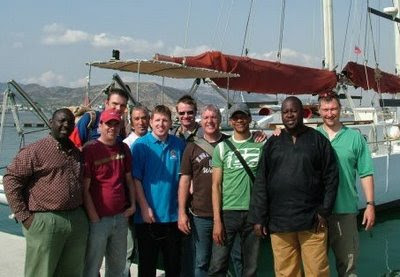 I took a covenant vow with a band of brothers from MKCC on a boat in Greece. I am at the table and I am not leaving. ah ha!! we now know who the famous 'anonymous' is - we have a picture! !